Former major leaguer Vinny Castilla took the time in 2010 to praise his former winter league manager Homar Rojas, according to OurSportsCentral. Rojas had managed Hermosillo until his ouster the week before, according to the site. "He's a man of baseball," Castilla told OurSportsCentral of Rojas, "a man I respect very much, and yes it was a surprise to hear about that." Rojas earned that praise in a baseball career that spanned three decades, a long stint as a player and a post-playing career as a manager. As a player, he spent four seasons in the Dodgers organization, but never made the majors. Rojas' career began in Mexico in 1982. He played for Monterrey over two seasons, then Mexico City for three. The Dodgers then purchased his contract from Mexico City for 1987. He played that year between single-A Bakersfield and AA San Antonio. He hit 230 over 31 games. He moved to single-A Vero Beach for 1988. He hit 274 there over 91 games. 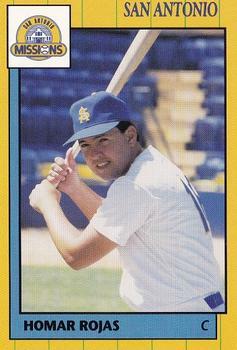 The catcher played 37 games in 1989, including one at AAA Albuquerque. He threw out a runner in a July game for San Antonio. He returned to San Antonio for all of 1990. He knocked in a run in a July game. He hit .282 overall in 82 games to end his minor league career. Rojas then returned to Mexico City and hit Monterrey for 1992 and 1993. He played for the Mexico City Reds and Yucatan through 1997, then the final seven seasons of his career with Oaxaca. He started his managerial career with Oaxaca and has continued in 2017 and 2018 with Rieleros de Aguascalientes. He won Manager of the Year honors in 2007-2008 in the Mexican Pacific League.